Earth Friendly Products glass cleaners can't be beat for cleaning windows, glass and mirrors without leaving film, streaks or hazing. And using this concentrated version to refill the Earth Friendly Product RTU Glass Cleaner Spray Bottles, the product becomes extremely cost effective.The Concentrated Lavender Glass Cleaner formulation (PL9963), is pleasant and soothing; and the new Concentrated Orangerine Glass Cleaner formula (PL9362) is crisp and refreshing. 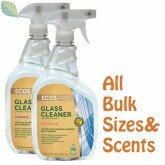 Both glass cleaner concentrate fragrances are free of ammonia and quick to dry. The Concentrated Glass Cleaner ingredients are readily biodegradable & pH balanced and are made using sustainable, plant-derived surfactants, making them planet friendly. Both versions are free of dyes, are greywater and septic safe as well as Recognized by the EPA’s Safer Choice (DfE) and USDA’s BioPreferred Program.